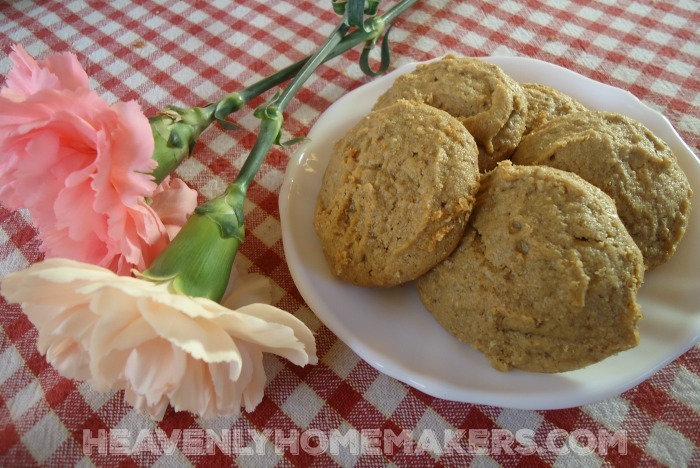 Low Sugar Flourless Peanut Butter Cookies and my Mother’s Day flowers! About the time I think I’ve cut the sugar in every recipe that would possibly work, I find another that works just as well. Do you remember my Flourless Peanut Butter Cookies? One cup peanut butter, one cup sugar, one egg. They’re delicious. They’re naturally gluten free so I can make them for my GF friends. They’re incredibly easy. And they have a very high sugar content. The only thing that didn’t work when I cut the sugar in this recipe is that the dough didn’t allow me to do the cute little criss-cross fork squish thing. The dough was too sticky. Thankfully, life goes on and we’re all grown up enough to eat our peanut butter cookies without fork-squishing them, right? Thank goodness. Get my Homemade Natural Peanut Butter Recipe here. Matt and I are totally good with barely sweet treats. But the boys? Well, they’re a little more particular. Therefore, my kids are always the true testers for whether or not one of my Low Sugar Treats actually tastes good to other people. I always hesitate to say these are low sugar, come try them because sometimes that makes the boys unsure from the get-go. But there I was, standing in the kitchen eating a peanut butter cookie. This made the boys suspicious. If Mom is eating it, it must be low sugar. All that to say: These cookies smelled really good, which made my boys want some. Then they saw me eating them, which made them not so sure. I insisted they try a bite because I thought they were so good I could hardly stand it, and I knew they would like them once they tried. Well, let’s just say that I had to stop them from finishing the entire batch in one sitting, and we all started shaking our heads once again at Betty Crocker for making us all think we needed eighty cups of sugar in cookie recipes just to make them taste good. C’mon, Betty. You’ll want to look through all of our tried and true Low Sugar Recipes here. It is amazing how much sugar you can cut out of treats and still make them taste delicious! 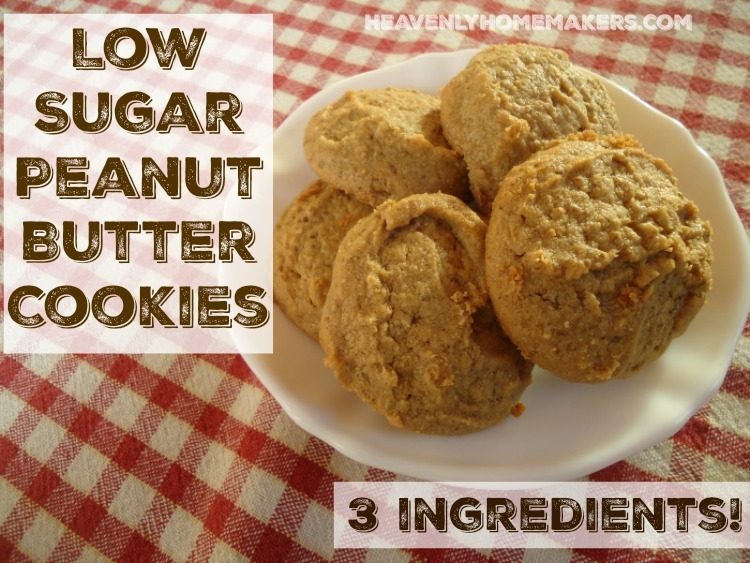 These Peanut Butter Cookies went from 2 cups down to 1/3 cup of sugar – and they are amazing. Need more Low Sugar Cookie Recipes? Yeah! Thank you Laura. I’m going to try making them with honey now. ???? Love the honey idea. What about with maple syrup? Or would that be too runny? Just wondering because I have way more syrup than honey right now.???? I may also try with almond butter to make them paleo compatible. Thank you Laura. I will have to try these. Could you add some coconut flour to help the dough with stickiness without adding gluten? Just a thought. I love your low sugar recipes! I have been cutting the sugar in recipes for years with little effect on taste. Maybe ol’ Betty is in cahoots with the sugar producers? I think you make your own peanut butter but for those of us that buy peanut butter would it be ok to use unsalted or would salted be better. I am using the trader jones brand which only has peanuts and salt (if salted). Do you know of any egg substitutes for baking? My son was recently diagnosed with wheat and egg allergies! Trying to revamp our foods now! We love so many of your recipes by the way! Thank you for coming up with these low-sugar recipes. My husband was just diagnosed with Rheumatoid Arthritis. His natural doctor seems to think sugar did this. He has impressed me so much by how drastically he changed his diet, and for the record, has not even cheated once in 6 months! I try to give him special treats but it’s so hard to find good ones without sugar. I have actually been taking yours and using maple syrup or honey and they have all turned out great! We all know sugar is bad for our waistline but you never think about the ways it is destroying your joints. Keep these great recipes coming!! Mine are very sticky even after increasing the baking time. Is this normal? My peanut butter seemed a little more oily than normal, so I wasn’t sure if it was a side effect of that or if it was to be expected. Hmmm, interesting. Mine haven’t turned out sticky before. I wonder if they need a little extra time in the oven?